Young fantasy baseball stars like Bryce Harper, Nolan Arenado and Giancarlo Stanton are on pace for 30 homers in the 162-game season. Last year, 11 hitters had at least 30 homers and just one, Nelson Cruz, had 40. Between 2010 and '12, there was an average of 22.3 hitters with 30 homers per season, peaking at 26 in '12 (some of the best names from that season include Jason Kubel, Chase Headley and Corey Hart). There were also six 40-homer guys in 2012, from Adam Dunn and Ryan Bruan at 41 up to Miguel Cabrera at 44. With just 11 hitters with 30 homers last season, power came at a serious premium in drafts back in March. Something funny has happened this year. Young sluggers have taken the league by storm, and now 26 players are on pace for 30 homers over a 162-game season. Giancarlo Stanton, Todd Frazier, Bryce Harper, Nolan Arenado, Albert Pujols and Paul Goldschmidt all already have at least 20 bombs. Five more hitters, including Mike Trout and Joc Pederson have 19. Seven players who are in the age-25 or younger seasons have left the yard at least 15 times this season. What does that mean for fantasy owners in the future? The legacy of the power hitter is in good hands with players like Stanton, Harper, Arenado, Trout, Pederson, Anthony Rizzo, Kris Bryant, Manny Machado and George Springer still improving. On top of that, Cabrera, Josh Donaldson, Chris Davis, Edwin Encarnacion and Jose Bautista aren’t going anywhere. This doesn’t mean that you’ll want to eschew power hitters in the early rounds and count on finding them late. After all, every name you see listed in this paragraph, with the exception of maybe Davis, will probably be off the board within the first two or three rounds of a redraft league next year. After a significant downturn in power over the last two season, however, the new wave of young talent is bringing the longball back in huge quantities. Arenado is coming off of one of the best weeks for any hitter this season after he belted seven homers in six games. Arenado had three mutli-homer games during the week, meaning it was more likely last week for him to hit two homers in a game than zero. He drove in at least one run in all six games, and had two games with four RBI. Arenado is enjoying the breakout season many people predicted he would have this year, but even those must bullish on the third baseman couldn’t have seen this coming. After his huge week, he’s slashing .293/.326/.632 with 24 homers, 49 runs and 68 RBI. He’s third in the majors in slugging, trailing only Bryce Harper (.715) and Paul Goldschmidt (.639) and is now on pace for 53 homers, 105 runs and 147 RBI. What’s more, he has actually been better on the road than he has been at Coors Field. He’s hitting .299/.342/.686 with 15 homers away from home, and .287/.309/.580 in the thin air of Denver. The 2015 season was lost for the Phillies from the outset, but at least this aged team seems to have one piece for the future in place. Franco has raked ever since the Phillies called him up in mid-May and he just had one of the best weeks of his young career. The 22-year-old third baseman hit three homers and drove in 13 runs last week, helping the Phillies to a 3-3 record against the Yankees and Nationals. He started the week with a dominant performance in New York, going 4-for-5 with a pair of homers, five RBI and runs. He hit another homer and drove in five more runs the next day, becoming the first player in franchise history to drive in five runs in consecutive games. In 172 plate appearances this year, Franco is hitting .304/.349/.559 with 10 homers and 32 RBI. The Yankees’ offense has clearly missed Jacoby Ellsbury (knee) during his time on the DL, but that’s no fault of Gardner, the fill-in leadoff man. He has been the most consistent hitter on the team all season, and that came to a head last week when he got hits in exactly half of his at-bats, sparking the offense despite sitting out one game. He needed just six starts to get 13 hits, notching four multi-hit games, including a 4-for-4 performance in the series opener against the Phillies. The 31-year-old is hitting .300/.373/.493 with nine homers, 58 runs, 39 RBI and 15 steals this season. Gardner is on pace for a 20-30 year with 100-plus runs and 80-plus RBI, and is currently the No. 4 outfielder in standard 5x5 leagues. 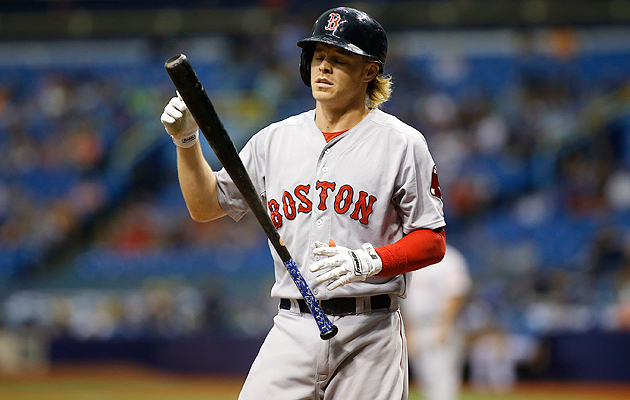 Holt has secured himself an everyday place in the Boston lineup, but he didn’t do himself any favors last week. He went just 2-for-24 and didn’t pick up his first hit of the week until Friday. Both hits were singles, meaning he hasn’t had an extra-base hit since he had two doubles and a triple on June 21. Holt was hitting .318/.407/.486 at the start of the week, and he’s now down to .289/.381/.437. If you’ve been relying on him over the last month or so, don’t worry about him losing playing time. He has been one of the few consistent bats in the Boston offense this year. Like most catchers, Grandal is a part-time player, though he does get the majority of the starts behind the dish for the Dodgers. Still, it can be hard to get a rhythm going when you’re sitting out a few times a week, and Grandal proved that last week. He got just one hit in his four starts and struck out six times in 17 trips to the plate. His lone hit was a single in the Dodgers’ second game of their weekend series with the Marlins, which was a 3-2 loss. Grandal was hitting .276/.386/.494 at the start of the week. He’s now slashing .259/.370/.459 for the season. The Cubs may be having a resurgent season as their days as playoff contenders have returned, but it hasn’t been all sunshine on the North Side of Chicago. Castro is having another one of his off-again seasons, typified by his performance last week. The Cubs were facing down a litmus test of sorts, with four games against the Dodgers and three with the Cardinals. They went 2-5 in those seven games, with Castro one of the primary culprits in their woeful offensive showing. He got just four hits—three of which were singles—in the seven games, and didn’t drive in one run. His OPS was already well below .700 entering the week, but he’s now slashing an anemic .260/.292/.338 on the year. Kemp apparently likes hitting out of the leadoff spot, something he hadn’t done in five years before manager Pat Murphy but him in the top slot last Wednesday. 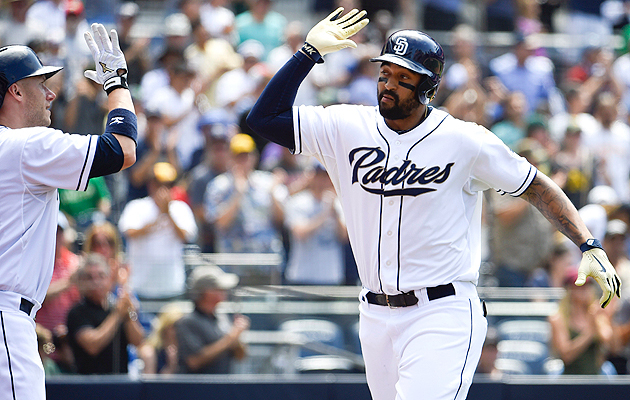 In the five games since the change, Kemp has gone 7-for-20 with a pair of homers, four runs and five RBI. Even if the power is returned for just the short term, hitting on top of the lineup should give him more run-scoring opportunities than he had during the balance of the first three months of the season. What makes him such an intriguing buy target right now is that he shouldn’t be too hard to pry away from his current owner. Even with the hot streak, Kemp’s owner likely isn’t married to the idea of having him on the roster for the rest of the season. In fact, this recent hot streak may be an impetus for that owner to sell him. Assuming the price is reasonable, and it should be, I’d rather be on the side betting on Kemp than fading him. There’s still enough talent here for him to be a top-30 outfielder for the rest of the season. If you can pay no more than that acquisition cost, go get him. Whether or not you’re willing to sell Turner will depend on how you’re using him. If he’s your second baseman or shortstop, or filling a middle infield slot, you’re probably not going to be as apt to deal him. If you have him at first, third, corner infield or utility, however, he becomes much easier to trade. No matter where he’s playing for you, understand why it wouldn’t be a bad idea to sell him right now. Heading into this year—his age-30 season, mind you—Turner was a career .281/.344/.395 hitter with 15 homers in more than 1,200 plate appearances. He did have the best year of his career in 2014, but it’s still unlikely that a guy develops into an all-around hitting star in his late-20s and early-30s. While Turner has been great again this year, you don’t want to bet on him making major league history. His 22.4% HR/FB ratio is bound to come down, and as more of his fly balls remain in play, his rates and, of course, power numbers will, as well. Turner can still be a productive player this year, and he’ll likely be a top-10 second baseman and shortstop for the rest of the season, but he’s not going to be producing at the rate he has in the first half. D’Arnaud’s injury last week was a real gut punch for the Mets and his fantasy owners, both of whom waited out his first injury and finally saw signs of life from him in that last game before he went back on the DL. On the same day that he suffered the elbow issue, he went 2-for-3 with a homer and three RBI. The Mets have not yet offered a timetable for his return, but there’s a chance he’s on the shelf for a long time. At this point, however, his fantasy owners shouldn’t do anything hasty. Slide him onto your DL and do the best you can to fill the void with whatever remains on your league’s waiver wire. Even if you have multiple players already on your DL, D’Arnaud’s ceiling may give him priority status on your team. On June 1, the Twins were 30-19, a half-game in front of the Royals for first place in the AL Central. Their 225 runs were the fifth most in the majors, and only the Astros and Cardinals had better records. Fast forward one month. The Twins are now 40-35 and trail the Royals by 5.5 games in the division. Their June wOBA ranks 26th in the majors, ahead of only the Diamondbacks, and three teams—the Brewers, White Sox and Mariners—that have been among the league trailers in every meaningful offensive statistic all season. Their third basemen were 27th in wOBA for the month, while their DHs were ninth among the 15 AL teams. Meanwhile, they have a top-15 prospect, who just happens to play third base, raking at Double-A Chattanooga. It shouldn’t be too long before we see Miguel Sano in the majors. ​Sano entered the season ranked anywhere between 11th and 13th on the prospect lists compiled by Baseball America, Baseball Prospectus and MLB.com. He has done everything to live up to that billing at Chattanooga this season. In 65 games and 281 plate appearances, he’s hitting .273/.370/.546 with 15 homers, 18 doubles and 48 RBI. He has struck out 67 times, but his 12.8% walk rate bodes well for his development. He has gotten better each month, and is hitting .329/.422/.671 in June as the month comes to a close. The Twins are still right in the thick of things in the AL playoff chase, but it doesn’t matter what happens to them as a team with regard to Sano. The team may want to see him at the Triple-A level before bringing him to the majors, but he’s going to be with the big league club for most of 2016. It would behoove them to get him some major league seasoning before then. Those of you in shallower keeper leagues should keep an eye on him right now. Sano could be quite the piece next season, especially if you have him on the cheap. By now, we’ve all seen the great catch Josh Donaldson made diving into the stands a couple dozen times. What you may not have seen was Travis Snider going full extension to rob Francisco Lindor of extra bases. See it below, in all its glory.